Facebook netizen and overseas Filipino worker (OFW), Rizz Leine DelaPaz RN shares her conversation with her Yemeni friend. In her Facebook post, DelaPaz narrates the conversation that started with a question. 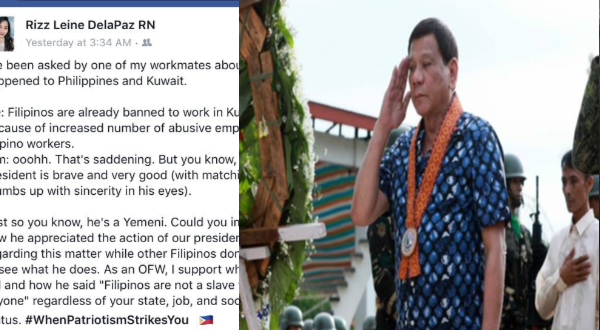 “I’ve been asked by one of my workmates about what happened to [the] Philippines and Kuwait,” the OFW said. She then explains the banning of OFWs in Kuwait due to the rising number of cases of maltreatment to OFWs by their own employers. The OFWs workmate replied that the situation was saddening, but he sincerely admitted that the Duterte was brave and a very good man. Delapaz then reveals that her friend was a Citizen of Yemen and that he appreciates actions of Duterte despite not being a Filipino, to whom she contrasts to a number of apathetic Filipinos. “Filipinos are not a slave to anyone,” the OFW reiterated. “…regardless of your state, job and social status,” she added.